And Much Much More To Come. The Fraud Has Been Exposed. The Evidence Mounts. Just in case you missed it on October 13th, here is another expert report, this time from a plastic surgeon concerning the case of Sister Lucy I and Sister Lucy II. Is this the same person that worked on the leaked third secret of Fatima? In it, the Papacy moves from Rome, Italy and goes to Fatima, Portugal. It makes sense in a way because it follows from the line that states that the dogma of faith won't leave Portugal. Newspaper Article Depicted in Fr. Luigi Villa's book, Paul VI Beatified? Above Newspaper Article from Voz da Fatima portrayed immediately above, indicates that the meeting and conversation between Paul VI and "Sister Lucy" only lasted for 3 minutes. The first article portrayed, I discovered in the book by Fr. Luigi Villa entitled Paul VI beatified?. It tells of the woman we now know as "Sister Lucy II" asking Paul VI for a private meeting --- if he believed she was the real Sister Lucy don't you think he would be interested in what she had to say (a new apparition, perhaps?) --- to this request the newspaper above cites him as responding, "As you can see, this is not the moment [I have not gotten all the publicity yet that is my due!]. If you wish then to convey something to me, tell it to your bishop and he will convey it to me. Put great trust in your bishop. Be obedient to him." What did the newly-minted "Sister Lucy" intending to convey to Paul VI? That she did not feel right about the illegal impersonation that she was now taking up? But, for Paul VI, how awkward would it have been to meet with someone you know to be a fraud. Be obedient! Take up the role that we have bestowed upon you and if you have any qualms of conscience or personal difficulties, go cry to the bishop! 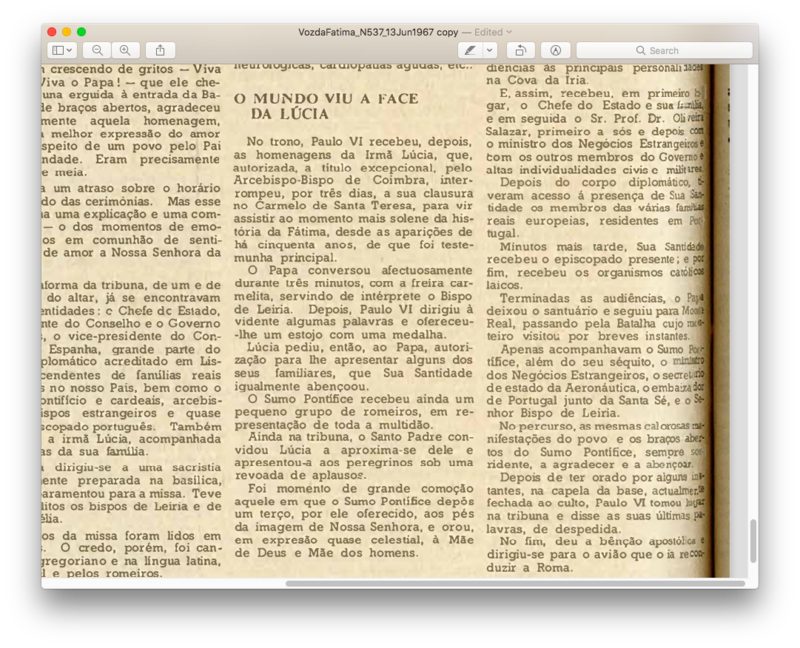 Another of the many strange things surrounding this 1967 meeting, amidst the general strangeness of the entire Sister Lucy dos Santos case, is the obviously faked pictures of her in Fatima, with Paul VI. Obviously they could not have been near each other for very long since so many pictures have clearly been faked. What we can see in the first picture presented in the Fr. Villa book is a Sister Lucy who never changes her expression and is inhumanly stiff and artificial in many of the pictures with her and Paul VI. As she stays creepily still, with the exact same gaze and expression on her face, the bespectacled priest is right behind her head on the left of the picture, then in one of the pictures below he is just as close to her on the right side of the picture, then he is a bit of a distance looking with almost an alarmed look on his face. The source picture for all of these "cut and paste" jobs from "Fatima" is given below in two different versions of the exact same photo is portrayed below with NO ONE IN THE BACKGROUND. Note of course that all of this deception was released within one month of the "meeting" between the two. Reality is stranger than fiction. In light of the complete transparency of the Sister Lucy Truth investigation. I feel obligated to tell the readers of RadTrad Thomist were we are now and where will want to SOON be. 1) We are still on the identification stage of the investigation. We are now very much in the process of collecting reports from relevant professionals which will testify to the identity or misidentify of Sister Lucy of Fatima I (pre-1958) and Sister Lucy of Fatima II (post-1958). Even though the evidence so far as been overwhelming, we want our thoroughness in the case to make any further scientific identification project unnecessary. I would hope that by Easter, this stage of the process could be completed. a) 3 Facial Recognition reports from 3 different algorithms and companies. All the companies have an international presence and sphere of operation. Also, a private investigator's report on all of this information, including information which has already been uncovered and fully reported. b) 1 Plastic Surgeon report. c) 1 Final Report from a Forensic Artist. d) 3 Reports from our Handwriting Analyst for 3 documents submitted to him. After this process is completed we want to submit the Tradition-in-Action "Third Secret" for scientific analysis. 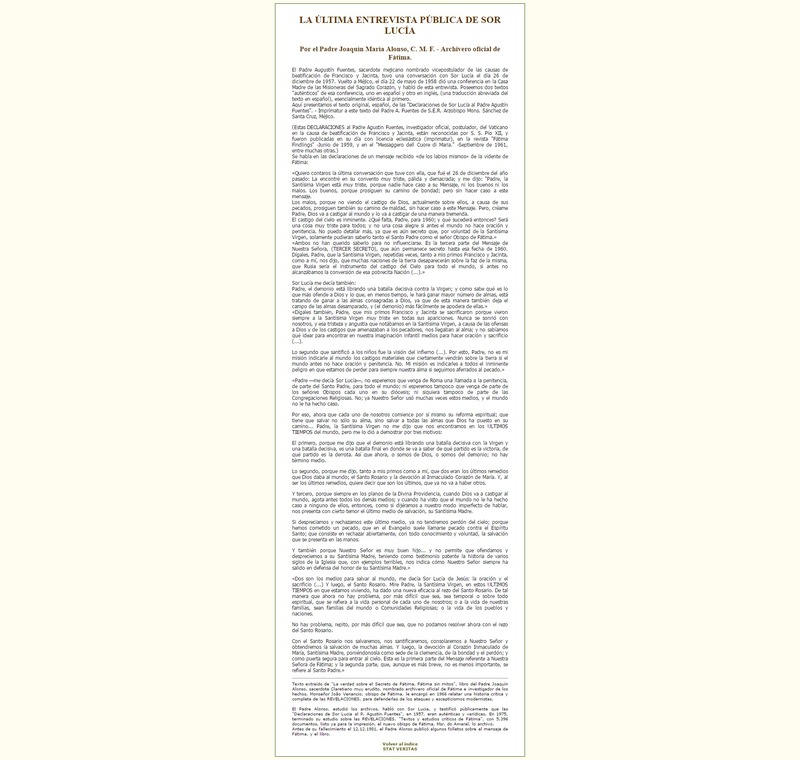 3) The Sister Lucy Truth website with all of the collected information and reports will be launched SHORTLY. My colleagues believe that the site can be made available to the public WITHIN THE WEEK. Since we are not finished with the identification process of Sister Lucy Truth, the website will allow for email updates to all of those who sign up, so that once new reports are added to the site --- as these come in, those who have subscribed will be informed of the new scientific information. 4) We are creating a presentation which will be given to private audiences ---- private, so as not to interfere with the ongoing investigation --- concerning all of the most recent findings of the Sister Lucy Truth investigation. One conference has already lined up this presentation. We at Sister Lucy Truth publicly declare that based on the evidence presented here, we have found it to be morally and scientifically certain that the woman portrayed to the world as “Sister Lucy,” from her first public appearance on May 13, 1967 to her death on February 13, 2005, was not the same person as Sister Lucy, Seer of Fatima and Visionary who predicted the Miracle of the Sun on October 13, 1917. This, one of the greatest frauds in the history of the Church, was discovered through the use of the most sophisticated facial recognition programs available, along with the accumulated testimony of plastic surgeons, orthodontists, forensic artists, private investigators, handwriting analysts, and facial recognition experts. Due to the availability of hundreds of photos of “Sister Lucy” available on the internet and in authoritative biographies, this case of substitution, fraud, and stolen identity has been able to be uncovered and analyzed. Without the judgment of the best and most relevant professionals available, we would not be making this grave accusation and presenting this charge. We will continue to accumulate and post on this site new studies and research concerning this investigation as they are produced and published. All of the names of the relevant experts shall be published along with their professional findings. The truth of the disappearance of the true Sister Lucy and the identity of the imposter who took her place shall be placed before an internationally based private investigator who will investigate and solve the case. The fraud has been identified and named. We charge the highest officials in the Vatican with conspiracy to perpetuate and conceal the substitution of Sister Lucy dos Santos of Fatima with an as yet unknown Imposter. 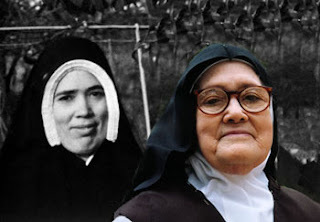 "Sister Lucy Truth began in 2017 as an effort to discover the truth concerning the life and person of Sister Lúcia dos Santos of Fatima. It was specifically begun as an attempt to find out, by using the latest scientific means and expert consultation, whether or not there was the substitution of an imposter for the real Sister Lucy of Fatima during the years after 1958. After establishing Sister Lucy Truth as a tax-exempt corporation in order to receive donations to advance the investigation, a world-class private investigator was hired to pursue the case. His task was to work first to establish the truth of the situation, and then, if it was found out that there was a substitution, the inquiry into the fate of the real Sister Lucy and the identity of the imposter was to be commenced. In the course of 2018, other contacts were made that put Sister Lucy Truth with a wide range of professionals, from accountants, to lawyers, and to the many experts relevant to identifying the woman who was presented as “Sister Lucy of Fatima,” before the eyes of the world from the visit of Paul VI to Fatima on May 13, 1967 to her death in 2005. One of the major events in the career of the woman known as “Sister Lucy” was her presence at the Fatima event on May 13, 2000 in which the Cardinal Secretary of State told the world that the Third Secret of Fatima was to be released to the world on June 26, 2000. Was the woman at these events the woman who had received the revelation at Fatima or was it another? Suspicions and questions related to the identity of the woman put forward as “Sister Lucy of Fatima,” especially those provoked by photographs available from official sources, were the initial reasons to begin the inquiry. The professionals hired to analyze the photographs, each according to their own specialty and with the relevant technologies, were asked to determine whether the known Sister Lucy, pre-1958, was the same individual as the one presented as ‘Sister Lucy” beginning with an appearance at Fatima for the 50th Anniversary of the Apparition on May 13, 1967. Sister Lucy Truth has now complied a sufficient number of professional reports to make the judgment that there were two woman, one the authentic Sister Lucy who was the Seer at Fatima in 1917 and an imposter who presented herself as the real Sister Lucy of Fatima at least from May 13, 1967 until her death on February 13, 2005. Even as we commission further reports from other specialists and facial recognition experts in order to complete our understanding of the imposture, we will use the information we have already compiled in order to discover what happened to the true Sister Lucy of Fatima and in order to identify the imposter." We are still on the identification stage of the investigation. We are now very much in the process of collecting reports from relevant professionals which will testify to the identity or misidentify of Sister Lucy of Fatima I (pre-1958) and Sister Lucy of Fatima II (post-1958). Even though the evidence so far as been overwhelming, we want our thoroughness in the case to make any further scientific identification project unnecessary. I would hope that by Easter, this stage of the process could be completed. 3 Facial Recognition reports from 3 different algorithms and companies. All the companies have an international presence and sphere of operation. Also, a private investigator’s report on all of this information, including information which has already been uncovered and fully reported. 3 Reports from our Handwriting Analyst for 3 documents submitted to him. After this process is completed we want to submit the Tradition-in-Action “Third Secret” for scientific analysis. Brief biographies of each expert consulted as well as their qualifications. We are creating a presentation which will be given to private audiences—private, so as not to interfere with the ongoing investigation—concerning all of the most recent findings of the Sister Lucy Truth investigation. One conference has already lined up this presentation. This important conversation of December 26, 1957 was the last public interview of Sr. Lucy. After it, permission was refused for any other interviews and she was effectively silenced and completely hidden away for the next several decades. These are the authentic words of her 1957 conversation with Fr. Fuentes, which came from the records of the official archivist of Fatima, Fr. Joaquín María Alonso, CMF. Fr. Alonso spoke with Sr. Lucy and publicly testified that her statements to Fr. Fuentes in 1957 were genuine and true. This text is from his book, La verdad sobre el Secreto de Fátima, Fátima sin mitos [The Truth about the Secret of Fatima without Myths ]. The text has the approval and imprimatur of Archbishop Sánchez of Santa Cruz, Mexico. “Father, the Blessed Virgin is very sad because no one has paid attention to her Message, neither the good nor the bad. The good, because they continue on the road of goodness, but without paying mind to this Message. The bad, because of their sins, do not see God’s chastisement already falling on them presently; they also continue on their path of badness, ignoring the Message. But, Father, you must believe me that God is going to punish the world and chastise it in a tremendous way. Father, the Devil is fighting a decisive battle against the Virgin and, as you know, what most offends God and what will gain him the greatest number of souls in the shortest time is to gain the souls consecrated to God. For this also leaves unprotected the field of the laity and the Devil can more easily seize them. “For this reason, Father, it is my mission not just to tell about the material punishments that will certainly come over the earth if the world does not pray and do penance. No, my mission is to tell everyone the imminent danger we are in of losing our souls for all eternity if we remain fixed in sin. “Father, we should not wait for a call to the world from Rome on the part of the Holy Father to do penance. Nor should we wait for a call for penance to come from the Bishops in our Dioceses, nor from our Religious Congregations. No, Our Lord has often used these means, and the world has not paid heed. So, now each one of us must begin to reform himself spiritually. Each one has to save not only his own soul, but also all the souls that God has placed on his pathway." “The first is because she told me that the Devil is engaging in a battle with the Virgin, a decisive battle. It is a final battle where one party will be victorious and the other will suffer defeat. So, from now on, we are either with God or we are with the Devil; there is no middle ground. “The second reason is because she told me, as well as my cousins, that God is giving two last remedies to the world: the Holy Rosary and devotion to the Immaculate Heart of Mary. And, being the last remedies, that is to say, they are the final ones, means that there will be no others. “And the third, because in the plans of the Divine Providence, when God is going to chastise the world He always first exhausts all other remedies. When He sees that the world pays no attention whatsoever, then, as we say in our imperfect way of talking, with a certain fear He presents us the last means of salvation, His Blessed Mother. If we despise and reject this last means, Heaven will no longer pardon us, because we will have committed a sin that the Gospel calls a sin against the Holy Spirit. This sin consists in openly rejecting – with full knowledge and will – the salvation that is put in our hands. “Also, since Our Lord is a very good Son, He will not permit that we offend and despise His Blessed Mother. We have as obvious testimony the history of different centuries where Our Lord has shown us with terrible examples how He has always defended the honor of His Blessed Mother. “Prayer and sacrifice are the two means to save the world. As for the Holy Rosary, Father, in these last times in which we are living, the Blessed Virgin has given a new efficacy to the praying of the Holy Rosary. This in such a way that there is no problem that cannot be resolved by praying the Rosary, no matter how difficult it is - be it temporal or above all spiritual - in the spiritual life of each of us or the lives of our families, be they our families in the world or Religious Communities, or even in the lives of peoples and nations. Sister Lucy Truth as We Inch Closer to the Truth. Dr. Chojnowski: Along with being the centenary of the death of Francisco Marto of Fatima, a cousin of Sister Lucy dos Santos, it is also the second anniversary of the death of our beloved friend John Vennari. That he should die on this day shows us that God stitches together the details of our lives and even our deaths with the steady hand of His Providence in the most wonderful ways. John was devoted to Francisco and that such a man should die on the same day as did the Visionary of Fatima, an apparition to which John gave so much of his life, makes us weep with tears of gratitude. Rest in Peace John. Francisco pray for us that we may set aright the grave injustice that was perpetrated on your cousin Lucia. Our Lady promised you Heaven. Be at our side. The latest coming into Sister Lucy Truth is very important and scientifically helps to identify both the fraud of the 1967 and after "Sister Lucy" but also DIRECTLY IMPLICATES THE CARMEL AT COIMBRA IN THE COVERUP AND SUBSTITUTION OF AN IMPOSTER FOR THE REAL SISTER LUCY. Soon to be published information, with the accompanying analysis and texts, prove that SOURCE TEXTS attributed to Sister Lucy, from which the "Pathways" book, published by the Carmel of Coimbra, is drawn, is an example of forgery. Also, what was that....the Carmelites of Coimbra are "Cooperators" of what organization........just saying. 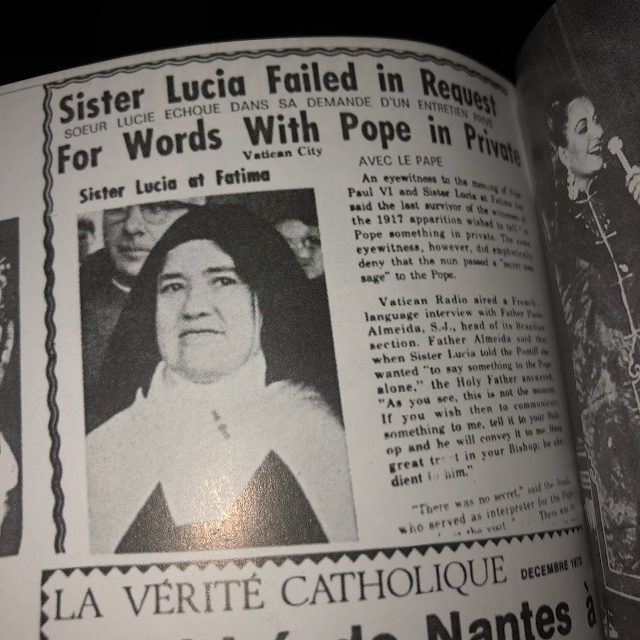 Thanks to one of our readers and his access to later editions of the "Pathways" book, we have located pictures of the real Sister Lucy, some of which date from the early 50s and one of them is dated 1956. This gives photographic evidence for the fact that Sister Lucy was very much alive in 1956. This information can be placed alongside the seemingly authentic interview with Fr. Fuentes on December 26, 1957 to establish the real Sister Lucy as still being very much on the scene at least until 1958.
because of the "in the garden" bit. Upper left photo shows the Sister Lucy I with the First Image of Our Lady of Fatima. This statue was give to here in or around 1947 and then made a pilgrimage through many countries. Photo at the bottom right shows Sister Lucy I with Bishop Ernesto Sena de Oliveira, along with Mother Prioress Sr. Maria de Cristo. Since Sr. Maria de Cristo was elected Mother Prioress no earlier than March 1951 and there is a letter by Sr. Lucy to the Bishop thanking him for his visit, dated April 26, 1952, the photo must date from the year 1952. This, along with the above photo from 1956, indicates that there are published and official pictures of Sister Lucy from the 1949 to the 1956 Period.